“This statute makes it unlawful to offer to sell a controlled (illegal) substance and then sell a noncontrolled (legal) substance in lieu thereof.” State v. Bussey, 444 So. 2d 63, 64 (Fla. 4th DCA 1984). In other words, the defendant is trying to scam the buyer with some non-controlled substance. For example, a drug dealer selling small sugar rocks to a person who is thinking he is buying crack cocaine. This statute should not be confused with the crime of counterfeiting a controlled substance inFlorida Statute 831.31 because the substance imitating a controlled substance in Section 817.563 is completely legal while the substance in Section 831.31 is illegal but is used to counterfeit a controlled substance. Counterfeiting a controlled substance can be done by “watering down” the controlled substance by mixing it with something else or by putting another controlled substance in its place that gives similar effects. It’s the same thing that happens at certain drinking bars where they sell watered down alcohol. Why sell a $3 glass of whiskey for $5 when you could water it down and sell $1.50 glass of whiskey for $5? (2) The defendant sold something in place of the controlled substance. "Sell" means the actual transfer or delivery of something to another person in exchange for money or something of value. The defendant had to actually offer to sell the drug. If the defendant is contemplating selling, but money never changed hands, he cannot be held guilty of this crime because there was no sale. See Mitchell v. State, 488 So. 2d 632, 633-34 (Fla. 4th DCA 1986). However, he could be guilty of attempting to commit this crime. See Carruthers v. State, 636 So. 2d 853, 856 (Fla. 1st DCA 1994). The punishment depends on what type of controlled substance is supposedly being sold. Florida Statute 893.03 lists controlled substances in schedules. 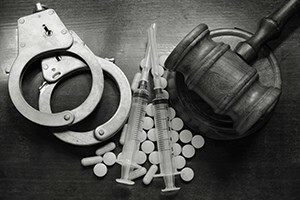 If the drug being offered is listed in schedule I, II, III, or IV, this crime is punished as a third-degree felony which is punishable up to 5 years in prison and a $5,000 fine. The crime is ranked as a level 4 crime under the Florida Criminal Punishment Code. If the drug being offered is a schedule V drug, the crime is a second-degree misdemeanor which is punishable up to 60 days in jail and a $500 fine. If you have been arrested and charged with this crime, call our law offices to schedule a free consultation. Our Wellington Fake Controlled Substances Sale Attorneys want to hear your version of what happened. We need you to tell us all the facts so we can then put together a defense strategy for your case. Our attorneys will take depositions of the police and find out what evidence the prosecutor has against you. We know that not all cases can be won. In these situations, our Wellington Fake Controlled Substances Sale Attorneys won’t throw in the towel, but we will keep fighting to have your charges changed to lesser charges or your punishment reduced. Call today so we can get to work helping you in this difficult time.